This old PRSC blog has now moved, and is incorporated into the new website which was launched early 2015. Follow this link to the new BLOG. 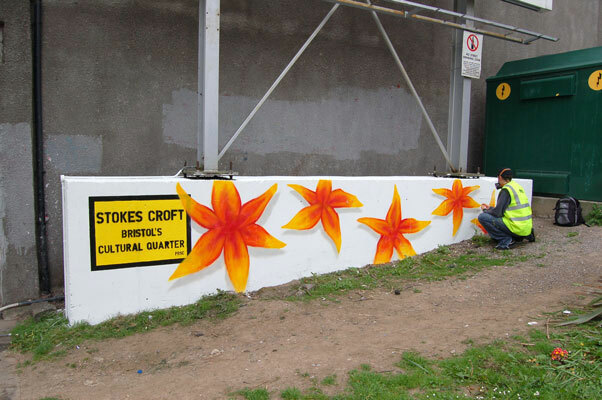 Detail of 90 metre mural on Gatton Road, alongside the M32. 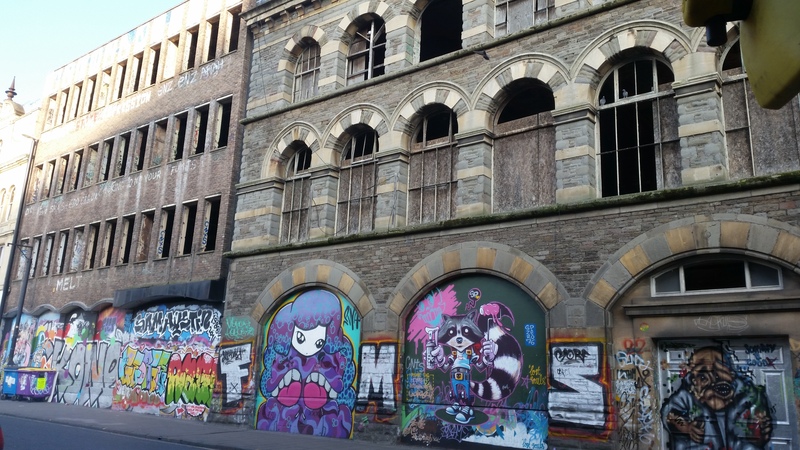 Stokes Croft is facing the imminent prospect of a gated community with the planned redevelopment of the Carriageworks, with next to no affordable housing and rocketing rents for everyone. 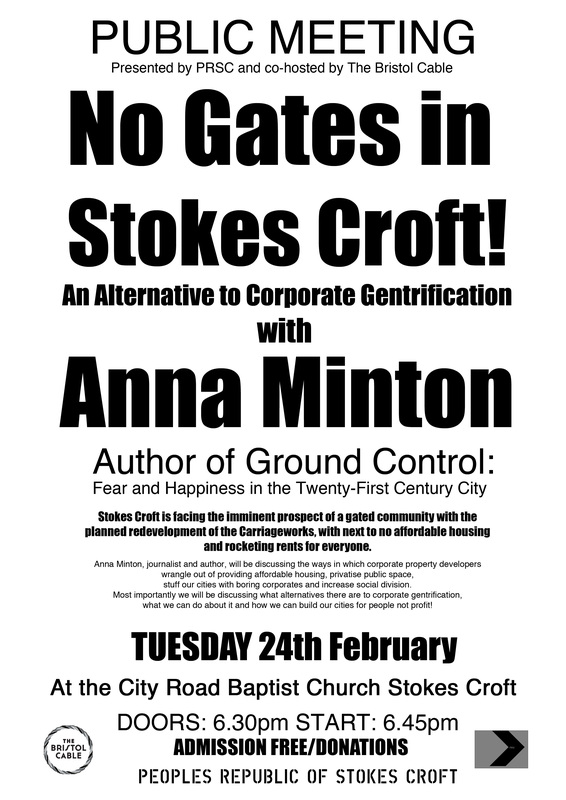 Anna Minton, journalist and author, will be discussing the ways in which corporate property developers wrangle out of providing affordable housing, privatise public space, stuff our cities with boring corporates and increase social division. Most importantly we will be discussing what alternatives there are to corporate gentrification, what we can do about it and how we can build our cities for people not profit! Find out more about the Carriageworks planned development here and here. Anna Minton is a writer and journalist and Visiting Professor at the University of East London (UEL). She spent a decade in journalism, including a stint as a corporate reporter on the Financial Times. Finding daily journalism frustrating she began to focus on longer projects for think tanks and policy organizations and is the author of numerous papers and reports, including the Joseph Rowntree Foundation’s Viewpoint on fear and distrust. In 2013, she became a Reader in Architecture at UEL. Between 2012-2014 she has been the 1851 Royal Commission’s Fellow in the Built Environment. APPLICATION TO “UPGRADE” Advertising Hoarding. get intrusive advertising displays removed by opposing this application. TO HAVE YOUR SAY, GO TO:. 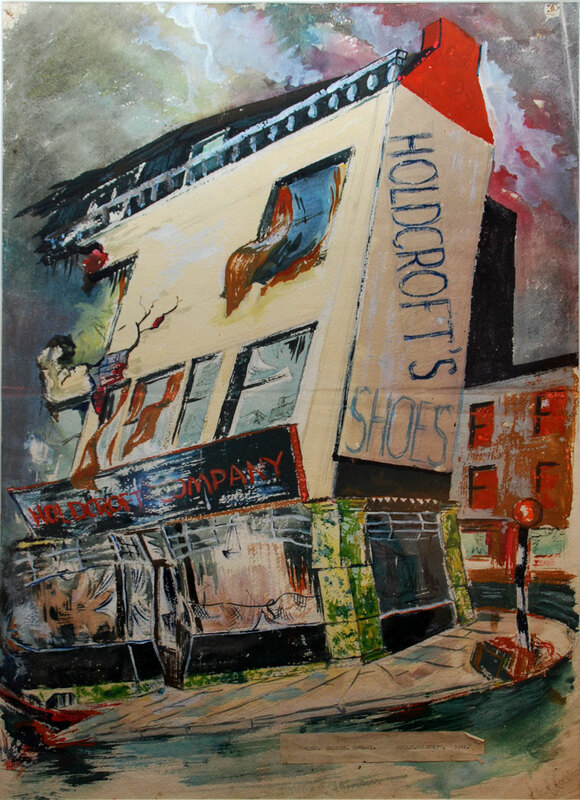 Above: Painting of the shoe shop that stood on Turbo Island ,engulfed in smoke. 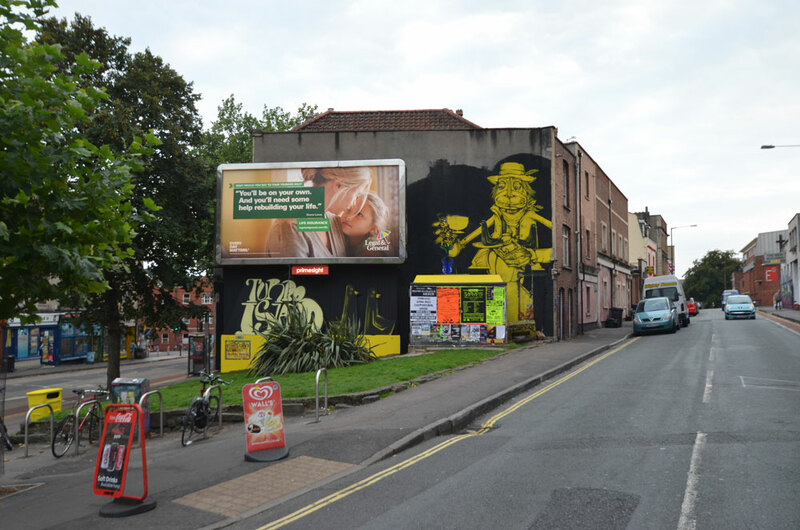 FIVE YEARS AFTER STOKES CROFT WAS DECLARED A CONSERVATION AREA. 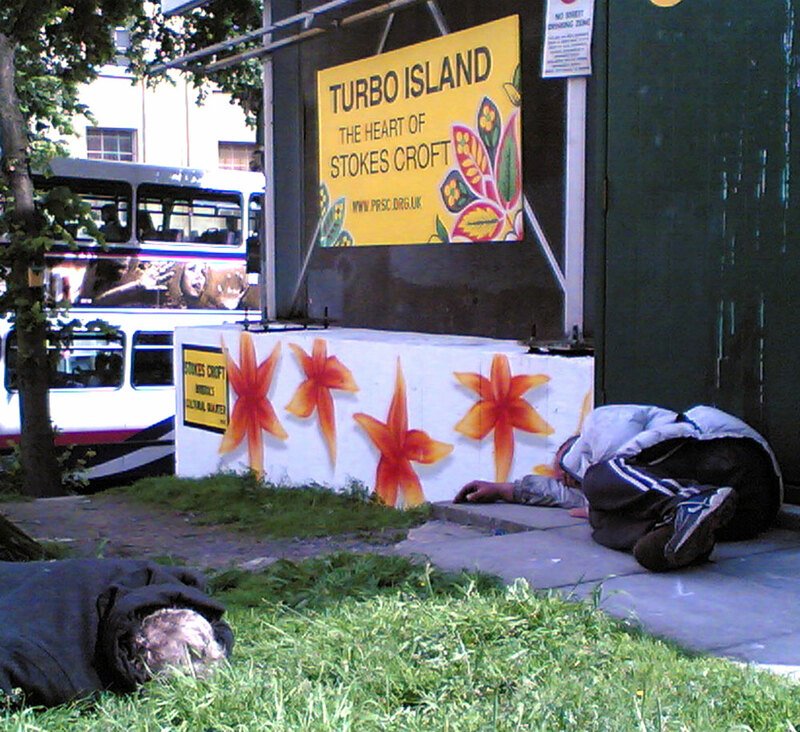 largely inhabited by street drinkers and drug addicts. 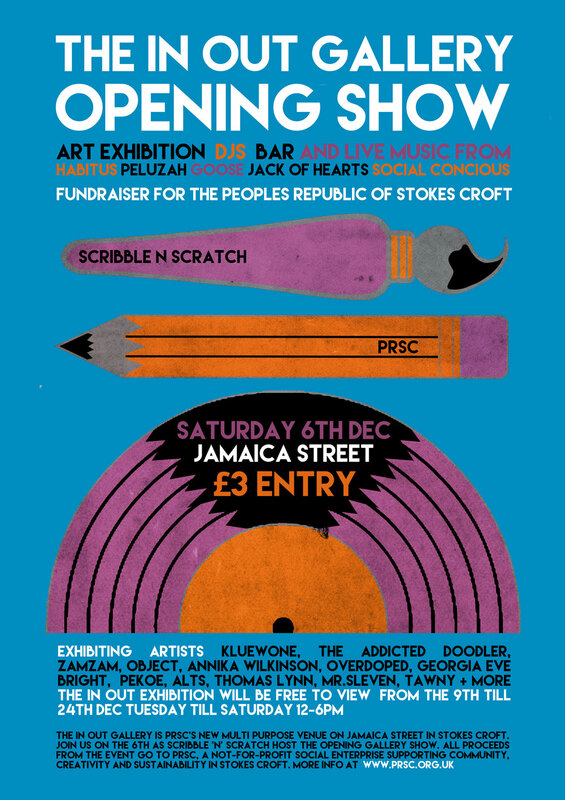 In 2007 PRSC started to make good, floating the then patently absurd notion of Stokes Croft as a Cultural Quarter. Seven years later, the landscape is very different. 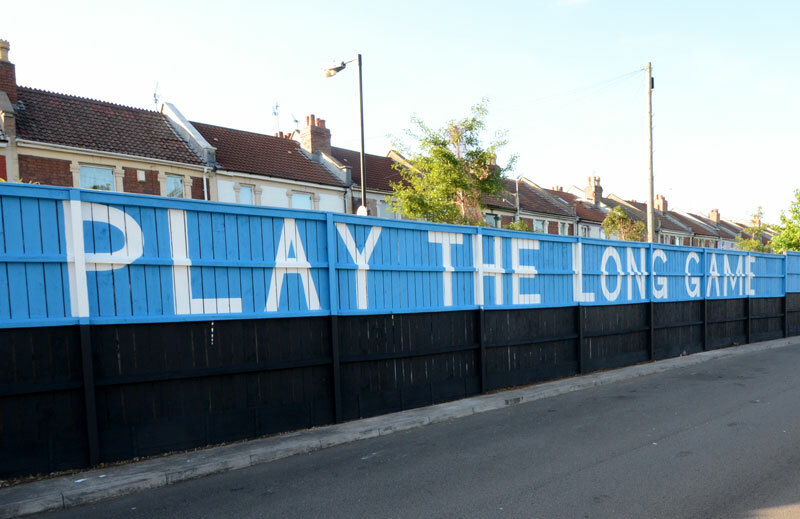 We believe it is time for this property to come back into community ownership. 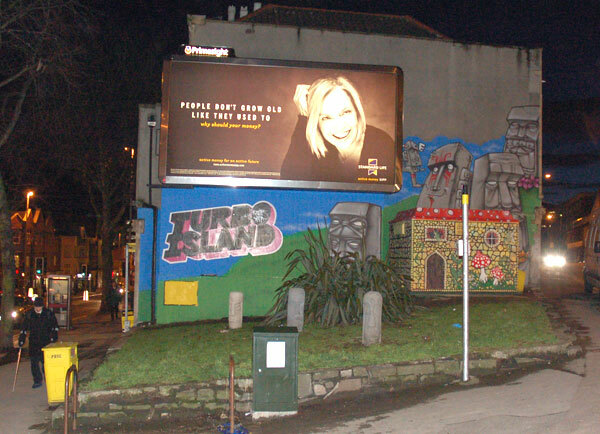 Turbo Island is a cultural hotspot. 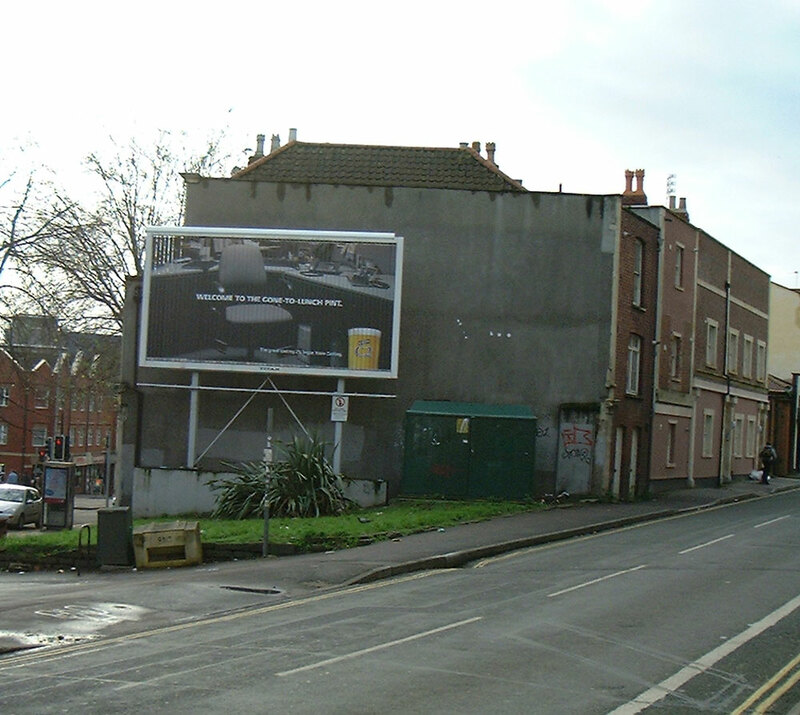 It is the perfect place to launch a campaign to remove advertising hoardings everywhere. The taking back of control of public space and visual amenity needs to start somewhere. 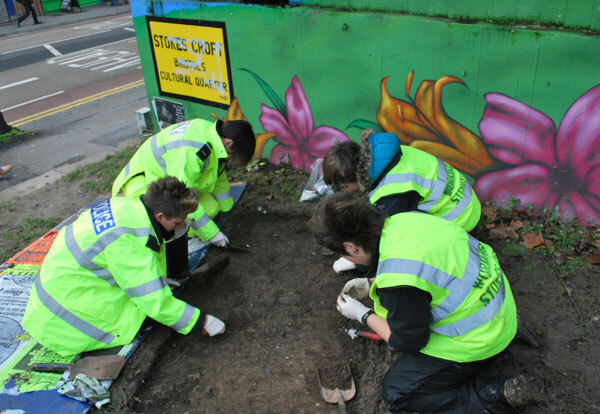 The Wave is a regular event at The New Building on Jamaica Street, Stokes Croft, focusing on ecological issues concerning wildlife. “The Wave” as a name encapsulates the purpose that we share with the PRSC – to confront urgent issues and thereby encourage a wave of activism. For the opening nights “Blue is the new Black”, the theme will be the marine environment, an environment that is often overlooked because it is not human habitat. 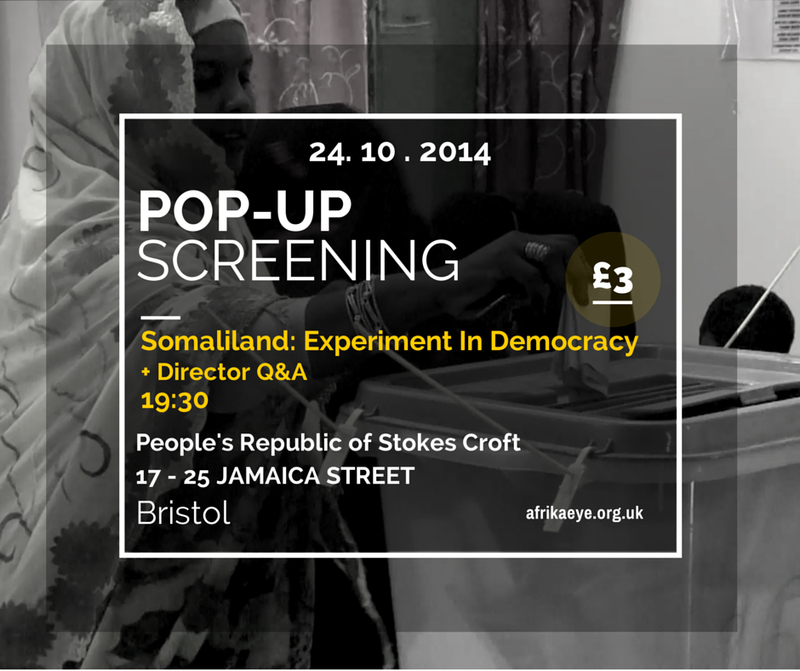 The events will take place on Tuesday 28th October 2014 and Thursday 30th October 2014 and doors will open at 6.30pm. The events will include talks, Q&As, art exhibitions relevant to sea-life and a documentary screening. We will be selling home-made vegetarian sushi in our resident cafe. The documentaries we have chosen to screen are Rob Stewart’s “Sharkwater” and “The Last Ocean” by Peter Young. Films will kick off at 7:30pm. Sharkwater: An eye-opening film which will change the way you view our oceans. Driven by passion, Rob Stewart debunks historical stereotypes and media depictions of sharks as monsters and reveals the reality of sharks as pillars in evolution of the seas.These majestic creatures have gone from predator to prey, and how despite surviving the earth’s history of mass extinctions, they could easily be wiped out within a few years due to human greed. The compelling imagery of Sharkwater exposes the exploitation and corruption surrounding the world’s shark populations and Stewart’s remarkable mission to save the world’s sharks which will in affect save humankind. The Last Ocean: The most pristine stretch of ocean on Earth, The Ross Sea is a frozen landscape that teams with life – whales, seals and penguins and largely untouched by humans, it is one of the last places where the delicate balance of nature prevails. But an international fishing fleet has found its way to the Ross Sea. Ecologist, David Ainley, rallies his fellow scientists as he knows that unless fishing is stopped the natural balance of the Ross Sea will be lost forever. They begin a campaign “The Last Ocean” taking on the commercial fishers and governments in a race to protect Earth’s last unexploited ocean from our insatiable appetite for fish. Taking place in our New Building this coming Friday.